Press Release | Singlish: Building language the fun way! Teachers struggling to instruct ever-growing numbers of children who don’t speak English have found that singing with their students hits the right note. Tulare elementary schools, for example, use a curriculum called Singlish that combines special CDs of children’s songs with posters of the song lyrics to help students struggling with English. Tulare schools have been using the program for the past three years. 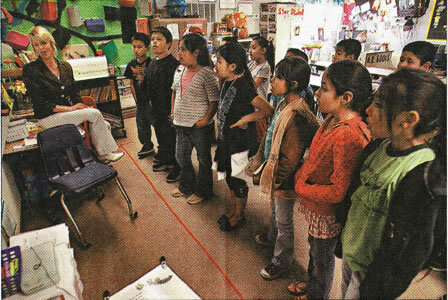 Throughout the central San Joaquin Valley — where one in four students are still learning English — singing is a proven technique to expand children’s vocabulary. “Children enjoy music, and before they know it, they’re using the language,” said Theresa Castelan, an English-learner teacher for the Clovis Unified School District. Although there is growing research on pairing songs with learning English, music instruction in elementary schools is declining because of budget cuts and pressure on teachers to focus on math and English. 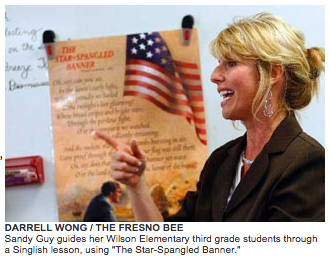 Sandy Guy, who teaches third-grade English learners at Wilson Elementary School in Tulare, said music, art and P.E. have all suffered because of the push for students to do well on state tests. On a recent afternoon, Guy taught the class to sing “The Star-Spangled Banner.” After they sang, she went over 10 words from the anthem she expected the students would struggle with. She also taught the history of the song and had the students talk about their experiences hearing it. The students also sang one of their favorites from the Singlish collection, “Down By the Bay.” Singlish offers folk tunes and other children’s songs such as “Farmer in the Dell” and “Yankee Doodle” for preschool through sixth grade. Former San Fernando Valley music teacher Ida Larsen launched Singlish out of her home in 1998. As a music teacher, she had created visual aids to help her Spanish-speaking students learn songs. Classroom teachers commented on how much English Larsen’s students were learning in music class, so she began developing curriculum for teachers. Her company is one of several that offer singing-oriented components to help students learn English. One of the reasons singing works is because children can practice language “without being singled out, in a nonthreatening environment,” said Teresa Huerta, an assistant professor in the Department of Literacy and Early Education at Fresno State. Huerta said that with the continued influx of non-English-speaking students to Valley schools, it’s more important than ever that teachers explore techniques to help their students. English learners are the fastest-growing student population in the United States, growing by 57% since 1995, compared with less than 4% growth for all students, according to a 2008 study by the Educational Testing Service based in Princeton, N.J. 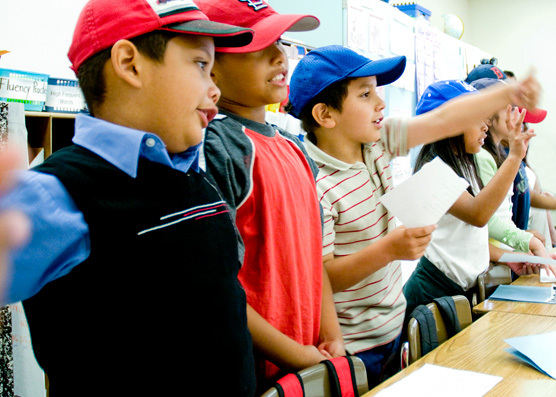 The study also found that California educates one-third of the country’s English learners — 1.6 million students. In the Valley, 26.4% of students in Fresno County were English learners last year, with even greater percentages in Tulare, Madera and Merced counties, according to the California Department of Education. Paul Reagan, bilingual coordinator for the Tulare City School District, is such a believer in using music to help students grasp English that he advocates all English-learner teachers in the district use Singlish. But studies about the effectiveness of using music to improve vocabulary have had mixed results. Researcher Suzanne L. Medina, who teaches in the School of Education at California State University, Dominguez Hills, had more conclusive results from a four-day study on whether music helped students learn English. She found that students learned an average of 1.5 words after hearing a story paired with music, while those who listened to the story without music learned an average of one word. Tulare music teacher Virginia Speckman wrote her 2004 master’s thesis on whether including music helped students learn English. She looked at vocabulary test results for two groups of kindergarten-age English learners after six weeks of instruction. Curriculum for one of the groups included music; the other did not. Her study found no noticeable difference in what they learned. But the students with music enjoyed the lessons more, Speckman said, and she was encouraged that they learned as much as the others despite giving up class time for music. Speckman, a music teacher for nearly 30 years, said music motivates students to learn. Students also are more successful at remembering information that’s accompanied by music, she said. In the Fresno Unified School District, English-learner teachers attended a workshop in November on using music to develop language skills, said Kate McKnight, the district’s visual and performing arts coordinator. For years, music teachers have seen the benefit of learning vocabulary with music; now others are seeing that, too, she said. 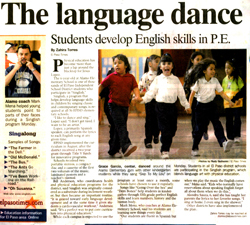 Students Develop English Skills in P.E. Physical education has become more than just a lap around the blacktop for Jesus Lopez. The 6-year-old at Alamo Elementary School is one of thousands of El Paso Independent School District students who participate in "Singlish." Singlish, a program that helps develop language skills in children by singing classic and contemporary songs, is required at all 56 EPISD elementary schools. "I like to dance and sing," Lopez said. "I don't get tired. I want to be an artist." Lopez, a primarily Spanish speaker, can perform the lyrics to each English song at any given time. EPISD implemented the curriculum in August, after the district received a two-year grant through Title V funds for innovative programs. Schools received two portable stereos, a compact disc and a cassette of the first two volumes of the music, laminated posters and a teacher's manual. Bill Anderson, who coordinates health and physical education programs for the district, said Singlish was originally considered as a substitute during inclement weather, but then became an important routine. "It is geared toward early language development and at the same time it gives students a cardiovascular workout," Anderson said. "It's a perfect way to put core curriculum into physical education." While each campus is expected to use the program at least once a month, some schools have chosen to use it regularly. Songs like "Going Over the Sea" and "Dem Bones" help students in kindergarten through fifth grade perfect English skills and learn numbers, history and the human body. Mark Mena, who coaches at Alamo Elementary School, said his students are learning new things every day. "Our students are fluent in Spanish but when we play the music the English comes out," Mena said. "Kids who normally have reservations about speaking English forget all about them when we do this." Alondra Sauza, 6, said she has taught her parents the lyrics to her favorite songs. "I sing at home. I even sing in the shower." Other districts have also implemented the plan. Ida Larsen demonstrates Singlish for teachers recently at Montague Charter Academy in Pacoima. The maker of music-education kits to help children learn language skills has seen its revenue fall. An expert suggests ways to boost sales. * Pump up your website. Singlish has a colorful website with photographs, videos and music files so customers can listen to samples of each song. What's missing is vital information on the home page that clearly states what the product is and why it should be bought. * Write a white paper. Barchers suggests that Larsen create and post online an authoritative, research-backed white paper that explains how music combined with movement not only fulfills a school's music standards but also helps children become better communicators. Such research has become increasingly important to customers in the education-materials field, she says. * Create an advisory board. Larsen should find five well-respected individuals in education who will agree to serve on an advisory board for Singlish. The board members should include academics and industry leaders in key positions as well as a teacher. * Increase focus on the preschool market. 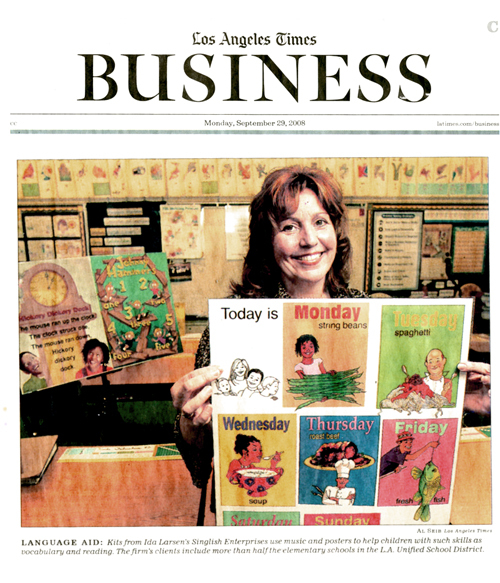 The consultant recommends that Larsen build on the success of Singlish's nursery rhyme song kit by approaching national child-care chains, such as KinderCare Learning Centers Inc. Start with the top executives and pitch the program's benefits, she says. * Develop distribution partnerships. Barchers also suggests that Larsen consider alliances with other educational publishers to include her products on their websites or catalogs. * Create momentum. All of these proposed steps can help Singlish create momentum in the marketplace, Barchers says. That will give her additional news to share with potential buyers and give her new publicist stories to pitch to industry publications. Los Angeles, CA – Sounds of music and children's voices singing "Take Me Out to the Ball Game" resonate through courtyard, late in the morning at Esperanza Elementary School in Los Angeles. The voices emanate from Room 23, where third grade English language learners are singing their way to fluency as part of Sandra Hernandez's "Singlish" class. "… for it's one, two, three strikes you're out!" Donning baseball caps, the kids mimic Hernandez's hand-count as they sing along with her and the music. Colorful posters depict images of baseball paraphernalia, accompanied by lyrics and baseball terminology. Hernandez says she feels it's important for ELL's to learn about American culture, in addition to learning English. "Songs like 'Take Me Out to the Ball Game' are part of America," she says. "I explained to them about the history of the song." "When I asked them how many have ever seen a baseball game, not one has ever been." "Singlish" (www.Singlish.com) was developed in the 1990's by Ida Larsen, a former LAUSD elementary school music teacher who was tasked with the challenge of teaching American songs to a student population dominated by English language learners. Larsen says, "As a music teacher, it was my job to teach the children music, songs and put on performances. I wasn’t told to develop an ESL program, but necessity is the mother of invention I suppose!" In June, 1998, California voters passed Proposition 227 which mandated English-only instruction in public schools. Larsen's fellow teachers began requesting the curriculum for use in their own classrooms. Today, Esperanza Elementary is one of many Los Angeles public schools using Singlish to supplement their Language Arts program. According to Hernandez, "Our students are required to memorize a poem or a song as part of their English language assessment. The Singlish program satisfies this requirement." 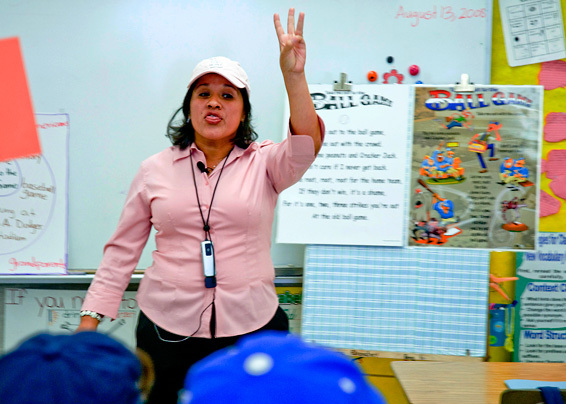 Hernandez, an avid Los Angeles Dodgers fan, adorned the Singlish classroom with her own visual aids. "I collected 'realia' to teach everything about the game. I downloaded pictures from the Internet and set up a table of baseball artifacts. I even drew the diamond to explain what the different players do." "Kids learn better with visuals," she says. "The great thing about this curriculum is having a visual to teach the songs." Having worked on "Take Me Out to the Ball Game" for the past few weeks, Hernandez says the kids can recite all the verses and sing the chorus." And as for "who's up next," according to Hernandez, "The next song they will do is the 'Star Spangled Banner' – also sung at the baseball game!" About Singlish - Singlish was created by Ida Larsen, a teacher with 20 years of experience in Los Angeles Schools. Through her experience teaching music in a large, bilingual, Title I (Federally assisted) school she created the educational program SINGlish. The concept is to teach children the English language through the singing of classic folk and children’s songs. It is a TPR (Total Physical Response) program, which means that all the learning modalities are being addressed; Visual, Aural & Kinesthetic. Learning is accelerated through music, movement and the use of visual aids. Language theorists have long regarded TPR as the most effective, stress-free approach to teaching language. This has been validated through extensive research, often funded through State and Federal Educational Agencies. By using the traditional songs of the United States, the children are also being immersed in American culture. For more information, visit www.Singlish.com. LOWELL -- It was all wiggles and smiles, and laughs -- lots of those, too, as the kids danced the "silly dance," shaking their rainbow shakers, banging on drums or tambourines a local day-care center kindergarten class one recent morning. While the kids at Little Sprouts at CrossPoint Towers were just having a good time during their "music hour," they were doing so much more, according to leading educational experts. The National Commission on Excellence in Education (NCEE) says, "Music combines behaviors to promote a higher order of thinking skills... provides for perceptual motor development. It fosters discipline and commitment." The positive influence of music in early childhood education is not new information. But scientific studies constantly show that children and infants who have music incorporated into their studies accelerate the development of their linguistic skills, and local early childhood centers are finding new ways to exploit it. "People who study music before the age of 7 have been shown to have a planum temporal -- the region on the brain's left side that processes sound signals, particularly language -- three times the average size," said Dr. Gottfried Schlaug, Ph.D., Harvard professor and director of Neuroimaging at Beth Israel Deaconess Medical Center in Boston. That has local educators incorporating music into their curriculum whenever possible. Bethel Child Care and Services of Lowell adopted Singlish, a music program designed to improve English and literacy skills. The program consists of music CDs and sing-along posters; as the kids sing to their favorite songs, they learn the written word through the posters. Bethel also distributed these CDs to the kids' parents to engage them in the education of their children and also to increase exposure. "The-itsy-bitsy-spider-went-up-the-water-sprout," sang the children at a certified Bethel Child Center in Lowell. Even though they were not old enough to read, they associated what they sang to the words on the poster. The purchase of the educational song kits were made possible through a grant given to PACE -- a nonprofit organization dedicated to advancing early education programs for underprivileged kids from the state's Child Care Quality Fund. Money from the Child Care Quality Fund comes from the sale of "Invest in Children" specialty license plates. Little Sprouts Inc. took on the FUNdamentals of Music and Movement Program. With the FUNdamentals curriculum kids each week participate in a half-hour music class where they sing songs in other languages, learn music theory, play a variety of instruments and learn dance moves. "G-cleff" screamed the children at Little Sprouts when Wyndy Jones, their music teacher, drew the note "G" on the board. "And where does he live?" asked Jones. "On a staff," the children responded, signaling the spot of the musical scale where the note resides.